Easy & Awesome Last Minute Halloween Recipes!! Directions: Squeeze the frosting into a microwave safe bowl and microwave in 15 second intervals, stirring between intervals, until smooth and semi liquid. Twirl top half of rods in frosting. Press one almond slice atop each pretzel rod. Stand prepared rods in a cup without touching each other and place in refrigerator until firm. Directions: Line a cookie sheet with wax paper; spread a layer of mini’s on paper. 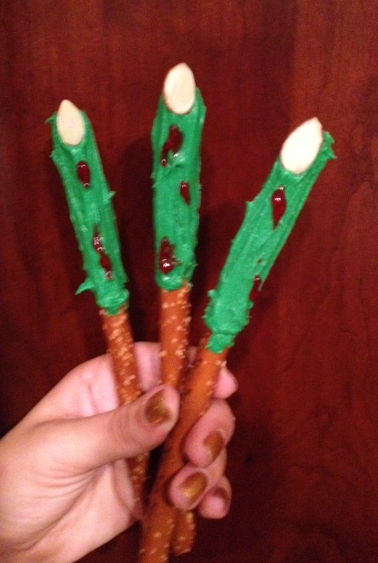 Using a flat tip, randomly squeeze the icing over the pretzels. 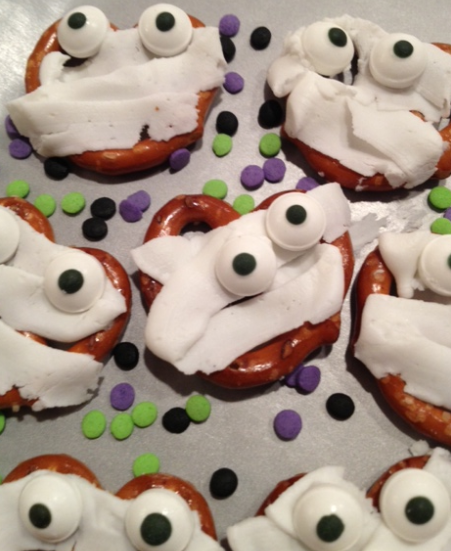 Adhere the candy eyes (as shown) by slightly dampening the back of each candy eye and press onto icing. Directions: Line a cookie sheet with wax paper. If using icing, squeeze icing into a microwave safe bowl, and microwave full power in 20 second intervals, stirring between intervals, until icing is pourable. Snip an “X” into marshmallow and insert pretzel rod. Add another marshmallow to the other end of pretzel rod. 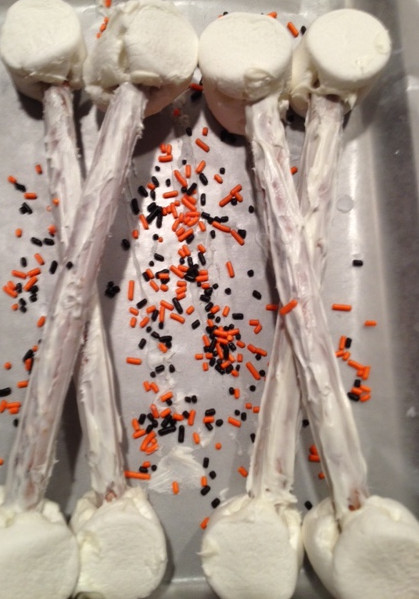 Dip each end of the “bone” into the melted icing or chocolate; let dry on prepared cookie sheet.